In Memoriam of A. Rublev. 1982. 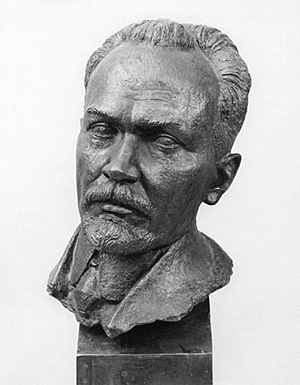 Portrait of V. V. Rozanov. 1990. 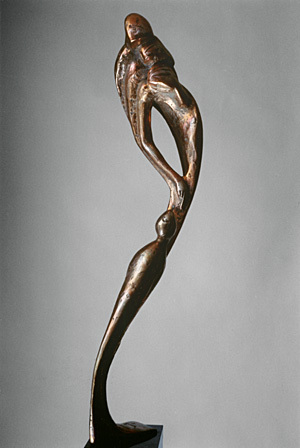 Sculptor Valery Yevdokimov was born in Moscow in 1938. A pupil of N. V. Tomsky and M. F. Baburin, he made his debut in the second half of the 1960s, immediately after being graduated from the Moscow State Institute of Art named after V. I. Surikov, when he was immediately recognized as an artist. 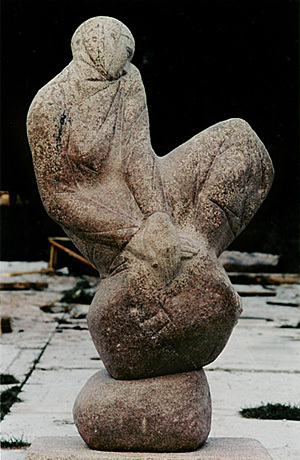 The three decades that have passed since then have become for V. Yevdokimov a time of profound and earnest creative searching, him being today, without any doubt, one of the most interesting sculptors working in modern Russia. We now offer to you an interview of Valery Yevdokimov given by the sculptor to journalist Yevgeniya Ivanova. — Your personal exposition was held in 1992, and another one – early in 1993. After those personal expositions they began to show Your sculptures at the Krymsky Val gallery together with those who are considered in our art circles as “artists of the 1960s.” How do You see the role of the artists of the 1960s in our culture? — I seem to see two sides in this phenomenon. The first one covers what was characteristic of the entire generation of that time: searching for the truth, the state of dissatisfaction with the existing condition of life. These psychological traits of the generation drove artists to not merely expressing dissatisfaction with the dominant art, but they also made them look for new ways, and that searching became for many a form of deviation from the official standards and ideas that were prevailing in society. That was the breeding ground for what they describe in politics as dissent, while in the fine arts that resulted in emigration of artists which fact was dictated by their unwillingness to do creative work under conditions of rigid regulation. The other side of the same phenomenon consists in the fact that with many artists of that time there arose an urgent need for departure from realistic art, the need being caused by the realistic tradition being officially inculcated and being considered as something which supposedly embodied the complete fullness of the Soviet art (which art was conceived at the time as being Russian, i.e., as purportedly the only kind of art which was possible in our culture at all), which tradition in fact adjudged us to virtually complete isolation from the world artistic process. The words “realistic”, “Russian”, and “Soviet” became very close synonyms. This is why the movement of the “men of the sixtieths” was joined by many of those who did not stay indifferent to politics, without thinking about conscious opposition to authorities, to the state system, but who felt that their isolation stood in the way of their creative development. The internal logic of artistic life demanded a breakthrough in the isolation, called for inclusion into the world artistic process. It was precisely this which pushed a certain part of the generation that was afterwards described as the “men of the sixtieths”, to their artistic past, which was conceived at the official level in a considerably curtailed form, as the past that was exclusively realistic. Meanwhile, standing at the back was the experience of the Russian avant-garde, the heterogeneous range of the artistic searching undertaken by non-realistic trends which the Russian art also had the time to experience, but that experience had been intentionally being hidden from us. On the other hand, they also were hiding from us the artistic searching of the western painters who were drinking from the same springs as the Russian avant-garde of the early twentieth century, and this is why the interest in our own avant-garde originated with many an artist under the influence of the western art. I have to emphasize for the sake of clarity that what I mean here are not only the Russian artists who have been officially denoted as belonging to the Russian avant-garde. Tradition has it that during the Paris exposition, of 1898 I think, Vrubel’s pictures were attentively studied by the young Picasso. His cubism was in some degree an extension and development of the searching by Vrubel, for cubism, both in appearance and in substance, is close to what the viewer would see when using a magnifying glass in order to study certain paintings by Vrubel. The above does not mean to say that I want to make Vrubel the Patriarch of Cubism, he was one of its unmanifest forerunners, being as an artist more associated with the nineteenth century and with Romanticism. The thing that is important for me in this context is the fact that before the 1917 Revolution the West European Art and the Russian Art were developing as one whole, but during the Soviet times they were divorced so that the West continued to be influenced by the Russian Art of the early twentieth century and by those painters who continued it, many of them finding themselves in emigration at different times. Meanwhile, the Soviet Art was being forcefully put into the Procrustean bed of the realistic traditions, and in so doing they canceled a whole historic stage in the development of the very Russian Art although it could otherwise be much broader and much more diverse. This prohibition resulted in the banned names acquiring special attraction which attraction was fused with the interest in the Western Art, that was awakened at the same time. — Which names of the avant-garde painters became particularly attractive at that time? - They were Tatlin, Lentulov, Larionov, Goncharova, Kandinsky, Shagal, Malevich. Malevich influenced greatly the various scientifically-induced forms of art exactly at that time, during the 1960ies. — I think that when I look at the Generation of the 1960ies, the thing that surprises me the most is their propensity for taking in everything at a gulp, without discriminating. The infrequently mechanical Tatlin is one thing, while the clearly ethnic and organic Shagal is quite a different thing. Or the abstractedly anthroposophycal Kandinsky or the purely decorative Goncharova. How can one unite within himself all these contradicting trends? In this lack of discrimination, in this eclecticism I see a manifestation of lack of independent personality, that is, lack of one’s own taste, culture, lack of one’s own creative aspirations – all these being characteristic features of nearly the whole Generation of the 1960ies. — You must be right, and one can supplement the row of the names that you have just cited, certain fragmentary temptations of the Western Art, Abstractionism, which is taken together with Avant-Garde. Artists found themselves in this semi-cultured bouillon who were unable to sort out things in this involved situation, that being the broth in which cooking at that time was what is described today as the Art of the 1960ies Generation; in addition to the inborn Eclecticism, there was present there also Eclecticism that had been acquired from outside. — Yes, the Generation of the 1960ies is not so much an artistic tide, a trend of searching, as it is a characteristic psychological type, exactly. They were the artists of that psychological type who made the core around which became united later, following the principle of kindred souls, people who, for some reason or other, had failed to fit into any other structures, failed to enter the official structures, failed to realize themselves in the official forms of artistic life that existed at the time. They were few who would not accept conscientiously those forms of artistic life. — There isn’t a thing for a modern person that would sound as hateful as the word combination of “Official Structure ”, the expression sounds strange when spoken by you . Would you explain what you mean by it? — This is, of course, in the first place, membership in the Union of Artists, but I also mean other things under the notion of “fitting into the Structures”. Many of those who joined the new trends had not always been able to withstand the seduction of the training in the art colleges, to survive the atmosphere of the college and to receive, nevertheless, the basics of the professional education that were supplied during the college studies. There exists a great difference between the education that is given in the colleges of easel painting and in pedagogical institutes, or, say, in colleges and schools of applied arts. The spirit of the time, similarly to the situation in the early 20th century, came into conflict during the 1960’s with the academic school, the school which only could be entered by those who were inwardly capable of climbing unhurriedly all the scales of artistic education. Many others, although quite talented artists, were destroyed by their lack of systematized education, which relegated them to dilettantism. From my point of view, in our generation there became firmly rooted as artists in the first place those who received substantial schooling before turning to modern arts. In so saying, I leave aside, of course, the issue of fame, success, etc., for all these often depend upon uncertain and contingent causes. — So it is your point of view that the ignoring of the academic school produced a negative effect upon the art of the Generation of the 1960’s, taken as a whole? — I’ll have to agree with you, I am afraid, even at the price of risking to offend some artists, although this one is just my personal opinion. But, speaking about the characteristic traits of the Generation, one cannot help noticing that, in addition to dilettantism, it had a lot of energy, expressiveness, readiness to defend their own persuasions, may be even considerable enterprise. There was present then the desire to create new things, to promulgate whatever they knew themselves, and there was no formal attitude, there was no apathy with regard to the what they were doing – the sin that was proper to the official art. — May be this “we” does not exist for me at all, and I am speaking thus without any feeling of pride, just stating a fact. I was partially an ally of the Generation of the 1960’s. I found myself a member of the Club of Artistic Colleges which was one of the first artistic associations of the Generation of the 1960’s. The Club stands in fact at the beginning of the history of the expositions held by the Generation of the 1960’s. The Club was set up at the Youth Hotel very early in the 1960’s, even before the decrees on intensifying ideological monitoring that were issued by Nikita Khrushchev. Well, at the time that was one of the bastions of the YCL, the Young Communist League. So, one day the Club of Artistic Colleges put together an exposition there, the first with the participation of Yankelevich, Sooster, Neizvestny, and others of the 1960’s Generation who are widely recognized masters now. At that time I did some playing at a jazz band and I invited some musicians to give a concert after the exposition would be opened. But the whole of Moscow knew about the exposition even before it was opened. And that was exactly the time when the sinistrous decree was issued by Nikita Khrushchev enjoining to intensify the ideological propaganda; the decree was adopted by him under pressure from a group of artists after the exposition marking 30 years of the Moscow Chapter of the Union of Artists – but we did not think much of that fact. So we come to the opening ceremony… only to see a lot of Friends of Order volunteer police there, and we were explained in so many words that there would be no any opening ceremony. A scandal broke out, the musicians refused to play at the event, as far as I can remember, there arrived at the hotel none other than Tyazhelnikov himself, the then first secretary of the Moscow City Young Communists; he literally shouted at us and he was banging his fist on the table. — I did not join it in the first place because then I did not yet feel myself as a mature sculptor, I thought that it was too early for me to make serious expositions, although I did take part in the Youth Hotel show. But going through a good school and receiving sound education was the most important thing for me at the time; I felt that the professional level provided by the college was thus far above my own level, and I did not want to be a free artist before the time. We undertook another attempt at holding an exposition of young artists, but that one was less conspicuous than the first one, and our Club ceased to exist. Looking now back at that time, I can say that I did not take part in the first attempt of the new art to become an independent structure. By that time I had already had certain experience in that field, although of a somewhat different kind. After my second year at the college I was expelled from it “for non-academic performance of the assignment”, but I was listed there again following the expulsion. So in answer to your question I can say that I not so much shared the mistakes of the 1960’s Generation as I made my own mistakes for which I had to pay afterwards. — What do you mean? Your departure from the realistic traditions? A lot of effort has been spent towards that, and I have not done a lot of something that I might otherwise have done – and this is what I regret so much. It was not a compromise to me, I valued sincerely the professionalism of the Official Art, and what I would rather describe as my delusion were my attempts to use that professionalism the way it has been used by the Official Art. — Now, in order to close the subject of you and the 1960’s Generation, I will put to you one more question: do art critics count you in that artistic trend? — Here I may cite the opinion of a man who undisputedly is well versed in matters of art. For example, when A. Glezer invited me to take part in an exposition held at the Krymsky Val gallery, where the core of the exhibits was made up precisely by works of 1960’s Generation artists, I chose my works “Proposal” and “The River Nerl.” Glezer’s first reaction was like this – this is not the 1960’s Generation manner, although the works were created at that time. But personally I consider these works as close in style to the searching of the 1960’s because manifest in them is artist’s thirst for expanding his artistic horizons, although from A. Glezer’s point of view the creation of those works did not produce a fact of taking part in the movement of the 1960’s Generation. Going back to the time when these works were created, I recall that it was then that I became interested in the artistic trends in Russia and in the West; it was also at that time that came to know Moore whose influence is felt in those works. I recall that it was exactly at that time that we were beginning to learn about Western artists from amateurish photos, in the same way that we were coming to know works by Alexander Solzhenitsyn from poor typing-machine copies. All these things are common to my life and to the lives of the 1960’s Generation artists. Now, as to the desire to oppose oneself politically to whosoever -- of that I have never had any, and this is what separates me and them, although my attitude towards them as those who were persecuted was one of full sympathy. — So,— neither a member of the 1960’s Generation, nor a member of the 1970’s Generation, nor even a member of the official camp, but just a professional artist — this is how your status is to be described in our cultural life. Now I would like to pass to other aspects of the problems which are subjects of discussion these days, since we touched in our discussion upon the theme of the relations between art and political authorities, a discussion which was started in the nineteen sixties. By now the once domineering system of state patronizing of arts has collapsed. Do you regret that and what do you expect from the future? — Yes, that period of time is over, and the only thing that we can expect now is emergence of new forms of cultural life. As to the future, I see it for the time being as largely indefinite. There must appear other forms of cultural existence. So far both our economic life and our cultural life are copying the western forms of existence. — Do you mean private patronizing of the arts? — I would not describe as patronizing of the arts as yet what I see now, it is sponsorship thus far. It is not always that this sponsorship appears in the name of art as such, extraneous circumstances often playing the main part. Patronizing of the arts will revive at a time when the class of “the new rich” feels internal need of culture, of which feeling there isn’t even a hint at this point in time. When I recollect the past, I feel not so much like making it return – that is hardly possible – rather like preserving the best things from that experience. I would regret if we gradually lose the experience of the collective forms of cultural life, such experience being necessary, say what you would, in order that genuine culture is able to offer resistance to the mass culture. When the artist is all on his own, he is more helpless and more defenseless, so in countries where the climate is more favorable for cultural life, this has brought about various sorts of artistic associations, take Australia as an example. It would be a pity if we lose our experience of association, particularly if we take into account the fact that experience was hard won. — I know that during the past summer you went to France and were able to watch the French artistic life. Your trip took place just at a time when there became evident the processes of beginning decomposition of the former forms of cultural life. Did your trip help you to evaluate those processes in a new light? — Yes, my trip turned out to be exceptionally useful in that respect. For more than a month I had the opportunity not only to work together with my foreign colleagues, but also to have a closer look at the cultural life as a whole. Now, I would formulate the overall result as follow: being given all the distortions and shortcomings of our cultural life, it has thus far managed to preserve its grand scale. I realized that not only after my last summer’s visit to Paris, but also after the previous journeys in Italy, Egypt, Greece, and also France. The grand scale is being preserved in our cultural life despite all that has happened. When compared to our artistic life, the modern artistic life in the West looks small-scale and isolated, particularly the life of the art galleries, and the instances of success that they score there look quite tiny. It should also be pointed out that while mingling with contemporary western artists, I came to value the professional level of our artists. If a western artist can size up to our artists in professional training, he, or she, must be a very good artist, and, as a rule, a very well known one, and consequently, a very expensive one. They know how to value professionalism there as nowhere else. There is yet another observation. Whereas with us the most materially prosperous section of the artists was made up by those who stressed their allegiance to the dominating ideology, in the West a similar role is played by the status of belonging to the avant-garde art. Demonstration of one’s belonging to this or that trend of the classical avant-garde is almost mandatory. It is a requirement that the “breed” of your art, its genealogy, be designated. It is very difficult to be an artist without keeping to that rule. Being original is not a conditio sine qua non, it’s rather the opposite – the important thing is holding a place in the ranks of some established branch the avant-garde. — This indeed is a sudden turn for the history of the avant-garde art – didn’t avant-garde begin as art persecuted, art unrecognized!.. — There is something interesting for me in this area. They usually describe as “Soviet art” something that came into existence as late as the Stalin era. But I think that that was already the result which had been called to life by the Lenin’s decrees which delineated a certain channel for the artists in which they were suggested to perform. — But do you consider as Soviet art the phenomena that became known during the Stalin time – the late Nesterov, Favorsky, even Galina Ulanova, for example? And can one rely on these artists when evaluating the cultural policy of Stalin? — I definitely recognize the fact of the existence of culture during the Soviet time, but that culture never was homogeneous. I recently had an interesting discussion with a journalist who was doing his utmost to convince me that Stalin was a good judge of art, and that in Stalin’s time the level of the art was very high, he cited Shostakovich, Prokofyev, and Eizenstein. But I think that in this situation we should distinguish between cause and effect. That was not an art which was created by the Soviet system, it was an art which came to be thanks to the high level that had been achieved by the Russian pre-1917-Revolution art. And one can say that in Stalin’s time there were preserved only individual artists in various artistic fields, who had been artistically fashioned before the Revolution or who were brought up by those who had been shaped during that epoch, and for those artists there were provided decent material conditions for them to perform within the framework of the Soviet art. In music they were Shostakovich and Prokofyev, in the dramatic art they were the Moscow Art Theatre, Stanislavsky. There continued to exist members of the “Knave of Hearts” Konchalovsky and Kuprin, as well as Nesterov and Korin. But for each one of those it was not the period when their talent was taking shape and flourished — Nesterov’s portraits of academicians were not the best, putting it mildly, of what he has created, and similarly to him, degradation touched Korin, Kuprin, Matveyev, even Favorsky. — This goes to say that in the deep strata of the Soviet art they existed already as if under conditions that were out of touch from the soil, from the culture which had brought them forth. Culture there was, but one has to explore as to at what cost it existed. The so-called Soviet culture existed while it was possible to live at the expense of the inertia that had been accumulated by the Russian art, that is, to exist on the ruins of the destroyed Russian culture. Even the ballet existed mainly by drawing on the experience of the Russian ballet school, and this may be the reason why it held on longer than did other arts. And that culture did die when there was nothing left of on what to feed, when gone was the generation which had preserved that culture. They were not the 1960’s Generation who “killed” the Soviet art, it perished all by itself when the source of its nourishment was exhausted. For as long as there remained inside people the personal properties which made it possible for them to oppose deceit inwardly, the arts survived. This is exactly why music and ballet held on longer than the other arts – they could not do without genuine professionalism there, while the meaning is not liable to unequivocal interpretation. Science was also lucky in part, it being of immediate practical importance in a number of branches, it was useful, so it was not being destroyed so grossly. Well, as to philology, philosophy, history — all those were being annihilated spontaneously and without any regret whatsoever. Being a philologist, you know it better than I do. — Yes, very much so. I worked for many years at the Institute of World Literature, my chief being G. L. Berdnikov, a corresponding member of the Academy of Sciences of the USSR. The existence of such people – before coming to the Academy he was deputy minister of culture of the Russian Federation – provides a key to the understanding of the essence of the Soviet arts. I closely watched him for many years but I couldn’t understand something about him – how did he get to the Academy, which winds brought him in? For, had he been something like a manager at a factory, he would be greatly valued there; he also could improve his family’s economy as well while working at a factory, much better than having to be in charge of culture and philosophy, although his colleagues in the Institute of History of the Arts remember the mahogany bookshelves which traveled to him from some museum. So here is the essence of the Leninist policy –every house cook should know how to run her state, and a Berdnikov, who made gross grammar mistakes when he wrote (the fact was notoriously scandalous and his handwritten notes were passed among personnel members) and who knew no more of literature than a secondary school graduate, that man “was posted” to culture. During the past few years there appeared publications about him taking part in the drives against Leningrad University, where he was ruthless in carrying out the various Communist Party decrees. But I think that those people manifested themselves in the most cruel manner not so much in all kinds of those one-time punitive campaigns, as in continuous and purposeful strangulation of culture, which was pursued day in and day out. I cited this example in order to pose my question in the following fashion: how did it happen that, given such individuals in authority, and having no favorable breeding ground, there appeared the scale of modern art which you mentioned in connection with your Paris impressions? --- In fact there isn’t any contradiction here. No matter who and in what manner presides over Culture, Culture, acting against all odds, has always succeeded in manifesting itself in a manner quite different from what it has been enjoined to be. Thanks to the efforts of officials similar to your director, there existed a stratum of ideologized art, a well-paid stratum, the one which provided the foundation for such officials and which provided them with the instruments for their directing. But as time went by, their reins slackened and other artists had a chance to breath too, all they had to do was not to claim the leading roles in the Soviet arts. Similarly, the dimensions of our arts were preserved not thanks to them, but thanks to the cultural possibilities of the large state, thanks to the cultural potential of the nation as a whole, even of the several nations which existed simultaneously within the framework of our state. 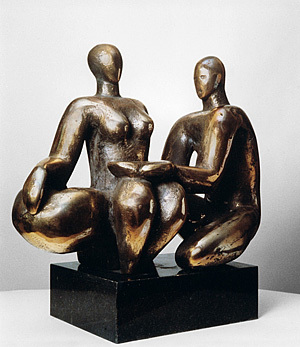 Art has its own logic of development, so one cannot say that the appearance of the Soviet art fordid the Russian art. Art develops continuously, although within this development there may be more fruitful and less fruitful periods. One day they call this art Soviet, at another time they don’t call it Soviet, but historically this is one and the same process which determines the same dimension too. The creative powers of a people, of a nation cannot be confined within rigid frames and destroyed, not even if to do so becomes a conscious purpose. I certainly have read it and many things in it I hold very close to me. It seems to me that Galkovsky has given a clear definition of the lack of cultural foundation which property underlay the Soviet culture, he gave to that phenomenon the name of “spiritual underground.” This is a highly fruitful definition serving to understand what is implied under the notion of “Soviet culture.” I also find correct the conception according to which there exists the ground-based culture on the one hand, and there exists underground culture. This concept contributes to the understanding of the whole history of culture, including the Soviet culture, and to the understanding of the life stories of individual cultural figures. I see in the notion of “underground” a fortunately-found handy analytical tool. As to his descriptions of individual artists, well, those are his points of view. — They were precisely those descriptions that caused a state of shock with many and that rendered a shading of scandal to Galkovsky’s article. It caught my attention that a newspaper ran a headline saying “Sensation-Making Article by D. Galkovsky.” But the article was rather a serious one and calling for a continuation of the discussion it raised. For the “1960’s Generation”, who are chiefly the subject of Galkovsky’s discourse, they include also , for example Tarkovsky, the Tarkovsky who turned with his “Andrey Rublev” a whole generation towards such layers of culture which had seemed to have been excluded from it for ever and aye. — This striving is undisputedly present here, but, parallel to this, the inability to understand the art of the past has been demonstrated in the film quite distinctly, that inability being, regretfully, a generic feature of the “1960’s Generation.” Paradoxically, the film takes us deeply into past centuries in order for it to reveal yet another Andrey Tarkovsky, one suffering from imperfections of life and dilacerated with passions. In real life Rublev was a monk who attained the highest steps of spiritual development, because otherwise he would not be capable of painting his “Trinity”. — I took the film differently; true, I saw it quite a long time ago, although I presume that all that you are saying about it is there in it. But it was something else that mattered to me in the choice of the theme: Rublev was chosen exactly by force of the maximalism which was laid in the generation, which is met not infrequently in Russian life as such. It is a different matter if Rublev was truthfully interpreted as a phenomenon. He could have been approximated to the level of the interpreter. But it is something else which is important: the characteristic thing in this case consists in the need itself to turn to the sources, to the essence, and to come to feel that essence. To me the paramount thought is that Rublev is ours, that he is our point of issue, this is an attempt to show where the roots grow. The reverse side being, well, the indestructible feeling of equality, perchance one of supremacy, the confidence that we are capable of understanding anything. This, by the way, is also present in ‘Stalker” – the independent search for answers that have long since already been available. The desire to get to everything through one’s own intellectual power, that not because the available answers are unsatisfactory , but because it is not even fathomed that these complicated issued used to excite other people before and that the answers to those were in fact found in the past. A typical intellectual’s situation. — Yes, when it does not even occur to you that there is the Gospel, there is the Bible, and nothing is novel under the Moon… As to your turning to Rublev, was it in any was connected with Tarkovsky? It was not – not directly. I actually did not know Tarkovsky personally, and I met him on one occasion only. But I remember that some feeling of being linked with him was born at the time, a feeling of spiritual kinship, not because of Rublev, but because of his art as a whole. Most probably, that was due to the problems that were common both to him and to me, and due to the common inability of both of us to find the exhaustive answers. My own interest in Rublev arose rather as result of my pondering over the fundamentals of the Russian art, which have not manifested themselves anywhere as clearly as in Rublev’s icons. When I came to take interest in the Russian icon painting, the first thing which struck me was the way the Byzantine canon was undergoing change when coming to the Russian soil, the way the Byzantine canon was becoming clarified with the Russian icon painters who, so it would seem, did their best in order to adhere to it as their primary task. The Byzantine canon in the genuine Greek art is loaded with human passions, while in the Russian icon these images are made transparent with spiritual light. As I see it, this may be one of the chief properties of the Russian culture – it is its capability to make more light and transparent borrowed forms that have been accomplished elsewhere. Examples thereof may be cited from various cultural fields. We were not the ones to bring forth the literary form of the novel. It first appeared in France and was adopted by the Russian literature. But they were Tolstoy and Dostoyevsky who elevated that previously accomplished literary form to a height which can never ever be surpassed – because at those levels problems evolve which transcend the limits of literature and which cannot be resolved by literature. — How do you understand the tasks of your art? — As far back as during my period of “Sturm und Drang” I formulated for myself the idea of my point of departure as follows: there are people who perceive color, there are people who perceive sound. The one clearest perception which I found in myself was my feeling of composition, space. If we trace in sculpture the gradual development of spatial thinking from petroglyphic art, through relief and to the round sculpture, it becomes evident that man’s idea of space and its laws was becoming ever deeper step by step. 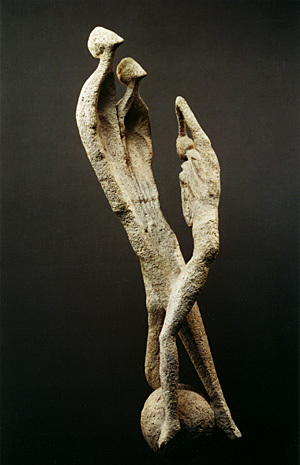 Generally speaking, in sculpture it is very difficult to be finding something new. The purely representational tasks have for centuries been resolved with such artistic perfection, that inside the traditionally understood sculpture there are only possible more or less successful repetitions. This is why it seemed to me that searching for new forms of representation could only be undertaken along the roads of enriching our ideas of space. The only schools that thought in serious of searching for new systems of new spatial constructions were the cubists and the suprematists, the avant-garde streams, which came later, acting blindly in this field. But the cubists and the suprematists were working at searching precisely for a new system, working to discover a new understanding of form-space. It is a different matter that they failed in their attempts to create such a universal system of compositional thinking and they used their methods by intuition. But I wanted to find the principle of compositional conjugation of forms in space and my compositions of the 1970’s represented my searching in that direction. That was particularly true with respect to my works after Bible and Gospel subjects in which spiritual tension and accomplishment are present in the theme itself, where there is present a kind of a spiritual space when at the very beginning of the story you have the absolute mutual moral relations which only remain to be expressed in the language of plasticity. In my searching I was guided not so much by theory as by intuition. If the universal model of life development represents a spiral (not necessarily a vertical spiral, a diagonal spiral will be even more representative, one that is positioned at an angle and widening as a cone), I have used that image in order to express plastically the idea, the wonder of human aggrandizement. The spiral is present literally in my sculptural piece “Steps”, where it is an image of development, aggrandizement, which action is performed by efforts of not only one human being, but by efforts of generations, which idea is expressed by the interchanging volumes of torsos. The piece has been conceived to render the feeling of a permanently continuing process of creative spiritualization of universal space, the process making the sense of human activities. But this is a vertical spiral, that is, so to say, the ontological spiral. In a number of other works I developed, in fact, these same ideas, but making use now of the diagonal spiral, such are the compositions «Ascension», «Ferapontovo», and «Eternal Road». So when I came across the idea of Rodchenko to the effect that the farther goes the diagonal, the more it will be perceived as one of the most important principles of composition (I may be rendering his idea in a somewhat different manner), that fortified my certainty in the correct direction of the searching. (Delacroix used to say that composition is built in the form of the Cross of St. Andrew . [Note of 2005]). — Was that direction in your searching oriented towards the avant-garde art? This is not quite so, this may rather be quite different. My searching acquired that direction precisely on the ground of studying the dynamics of the classical styles in the arts. 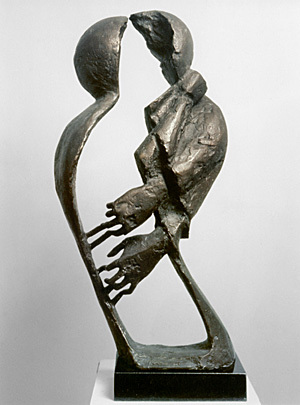 If we consider sculpture as a developing process of cognition of the world, cognition of the world in its artistic form, then we should name as the beginning of the plastic thinking of the world the moment at which the artist noticed that the displacement of the human body occurs thanks to the fact that there exists a certain interaction among the motor impulses, these impulses interact among them according to the law of spiral: the movement of the right leg negates movement of the left leg, etc. This dialectic allows the body to traverse and take various attitudes in space. The discovery and the perception of this law distinguishes the Greek sculpture from the Egyptian sculpture. In the Egyptian sculpture human beings stand and walk by putting their weight on both feet. During this process the body is motionless and the position of the pelvis is horizontal. Then the Greeks came to realize and evaluate aesthetically the observation that when a human stands in a certain attitude, the larger part of his weight is transferred to one foot only, and when he walks, the movements of his legs and parts of his body are not symmetrical, but antinomic, due to which fact there appears the well-known plastic effect. Both the pelvis and the pectoral arch change the horizontal position during walking into inclined position and become positioned one at an angle towards the other. So these Greeks’ new compositional observations enabled them to say a new word in the understanding of space and its laws. Thanks to this, the flat figure of the Egyptians became with the Greeks a complicated spatial phenomenon. This enabled the Greeks not only to render the movement of human body, but also to interpret man’s certain internal state which stayed in wonderful correspondence with the philosophy of the man of antiquity. The man was represented not in the tense static condition as with the Egyptians, but in a sort of dynamic rest which radiates the feeling of freedom and day-dreaming. The Greeks found a plastic expression of that condition and discovered that law of composition precisely because that was important for them, because that expressed their attitude towards the world. What is more, I would say that the Greeks have in fact exhausted all possible manifestations of that law in the composition of the single human figure. As to taking several figures, the Greeks’ discoveries are limited here by two-dimensional compositional space. All this is present in Phidias’ relieves of Parthenon – all possible composition situations on the plane. -- And the time of the Renaissance, Michelangelo presented a new step along this road, by showing man who was enlightened by Christianity, that is, an individual of a qualitatively different spirituality? It seems to me that in the sculpture of the Renaissance the purely spiritual dimension of the individual was not the most important thing. I am interested in the sculpture of the Renaissance from a different point of view. Here posed was a new composition task – to find the law of interaction between two or among several figures, to come by palpation upon the field of their spiritual rapport. So it was Michelangelo who, by expanding the spatial thinking, made the next step in the direction of which I spoke. But it was not incidental that Delacroix described Michelangelo as more of a painter rather than a sculptor, his works being designed to be viewed from one point only, from the frontal point. Hence the following generations took the previously trodden path and proceeded farther on in their continued search for these new compositional laws of interaction. Here I would like to identify two other phenomena which are important to me, although they are of different values for the history of world sculpture. The first one is the Russian wooden sculpture which I saw in museums of Vologda and Perm. The second phenomenon is Rodin’s work “Monument to the Burghers of Calais” which I was able, by the way, to study with all attention for the first time during my visit to France, while I knew it before from photographs. In both these cases there is present further searching for compositional interaction. It should be pointed out that Rodin’s individual figures are actually works of genius, but they are not united rhythmically, although it is beyond any doubt that he made efforts toward them becoming one whole. At the time when I began my searching, my primary task consisted in giving up live forms, and in the process of that search for compositional interaction I operated with abstracted spatial objects. Along that avenue created was a whole series of my works – “Ascension”, “Opening”, “Cathedral”, “Birth”. — And what is your evaluation of your artistic accretion along that road? — As I realize now, there were things other than gains. Also, the price paid for the acquisitions was dear. Along that road art becomes dehumanized, it loses its human measure. From the artistic point of view, there can be found a justification to this, probably in the 20th century cataclysms in which the human measure was forfeited to such a degree. This departure from man as unique individual and operating in masses, in aggregate notions is probably the thinking mode of the entire 20th century. What art does is no more than translate this universal process into its own language, laying bare the decomposition, the forfeiture of human as measure of things. But one cannot travel that road for long, the life of the human spirit being richer and non-reducible to that decomposition. The movements of the spirit, which are thoroughly complex and basically serious, are alas inexpressible in that language. As soon as we abandon human face, abandon the stare of human eyes, the fine arts become deprived of their compass. Given all the liking for the Impressionists, one comes to realize that their art has its limits – the most elevated conditions of the human spirit are inaccessible to their language. This is the reason due to which returning to the art of human content was felt by me at a certain point in time as the necessity. But in so doing, I felt that I ought not either to let go of my experience which had been accumulated during the period of my formal searching. What I was striving for was to come by a certain synthesis which would make it possible both to render the spiritual heights of human individual, and the feeling of that individual’s connection to the surrounding world, those complicated processes of interaction with cosmos in the broad sense of the word, interaction with the spiritual essences of the surrounding phenomena. -- This precisely has been my approach to portrait. “Nikon Mikhailovich” was my first work in that trend, then came the portrait of my mother (1975-1978), although those portrait compositions are not yet portraits in the full meaning of the word. — Was there any internal logic inside that portrait series, or was its appearance determined by some external factors, such as accepting artistic contracts, for example? -- There were contracts all the time, they made life possible for me and my near and dear ones. But they were other works which made the essence, and among those there were undoubtedly palpable internal links. After the portrait of my mother and my “Self-Portrait”, the portrait of Dmitry Galkovsky, then the portrait of Pushkin, afterwards the portrait of Vedernikov became the most important works for me. Those works came to be created in different ways, but in the process of their realization connections were opening amongst them for the task being performed was but one: to find in a human face a reflection of a certain inner state which carries the spiritual essence of the particular individual, that expression of the moral values whose accumulation spiritualizes cosmos, and makes that individual party thereof. — But how did appear the portrait of V.V. Rozanov? There wasn’t, of course, anyone to order it? -- I became interested in that subject during my work at the portrait of Galkovsky. Galkovsky is very much captured with Rozanov, he put forward to me his ideas of Rozanov, he cited his favorite extracts, and I had read Rozanov’s books before. That interest grew also due to my communication with Victor Sukach, also an acquaintance of mine. It was he who made it possible for me to use rare photos and books and he insisted that I should make Rozanov’s portrait. So gradually I came to taking the decision and started to work on the portrait. —To me, however, Rozanov was opened quite from a different aspect. I see his power in his exceptional rooting in the fundamental bases of life. This in-depth connection is manifested for me in an episode like the following one. He once went to church together with his daughter and was simply standing there. That happened at a time when he was unable to have his divorce from Appolinaria Suslova, and because of that his children remained unrecognized and illegal. Now, when he recalled that the Church did not want to recognize his family, he left the church and took his daughter with him. Since the Church did not care about his plight, since it could bear keeping his children in the condition of bastards, he felt that he could no longer stay within its walls. I am not going into the matter of him being right in his grievances, I don’t see this as the most important thing, what I am drawing attention to is Rozanov’s ability to face the Church as institution single-handedly. For him the non-recognition of his children by the Church was not a matter of mere formality, that meant for him too many things. He suffered the fact of the non-recognition not only as a formal obstacle in the road to the proper schooling, but as a fact which dealt with the very essence of his family life. This goes to say that he was rooted in the Church even in that grievance of his, that such a man cannot live without the Church, and the Church cannot either exist without such men, may not exist without such men – even if they are deluded – they are its mainstay. That deed of his, those foundations reflected for me the essentials of Rozanov which made me represent his visage the way I did. 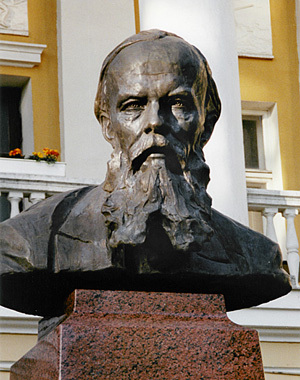 — Now, coming to the end of our conversation, I would like to put to you one more question, which is particularly important for the readers of the Continent journal, and it deals with your latest work, your monument to V. Solovyov. I must mention, that I took part in the ceremony of the laying of the first stone at the site of the would-be monument in the courtyard of the Institute of Philosophy. A am glad at the very fact of that project and I am glad that our readers will be able to see the monument. How did you take that work? — Beginning with the portrait of Galkovsky, and coming through my work at portraits of Pushkin and Rozanov, there became traced for me a new theme -- a conjugation of an individual with a certain spiritual space, that space being the national space, an ethnically colored spiritual space. These portraits as if reflect for me different facets of certain ethnic, national idea, the “Russian idea”, as they describe it sometimes. Solovyov continues the series. Although most of his portraits show some taint of demonic character, I found in one of the photos something that I consider as the mainstay of the entire Russian art, and that I spoke about earlier in connection with the works of Andrey Rublev: the ability to bring to light ideas that come from without. That was also the road traveled by the Russian philosophy, traveled by Solovyov the thinker, although his roads were not straight ones, which also adds another facet to his image. That early photograph shows him looking far ahead from the depth of his inner world, far ahead where he feels existence of light and his own connection to that light, the connection creating the spiritual field of the image, which field I tried to represent as best I could. Yes, and these, as you say, supervaluable ideas, consist for me, when applied to the Russian art, in its mission of putting to light everything with which it comes into contact. I find this same mission in our history too, and in our social life, and it is desirable to be able to stay true to it throughout whichever new historic roads to be taken. Where we succeed in doing so, the culture shall continue to be Russian and it shall perform its predestination.